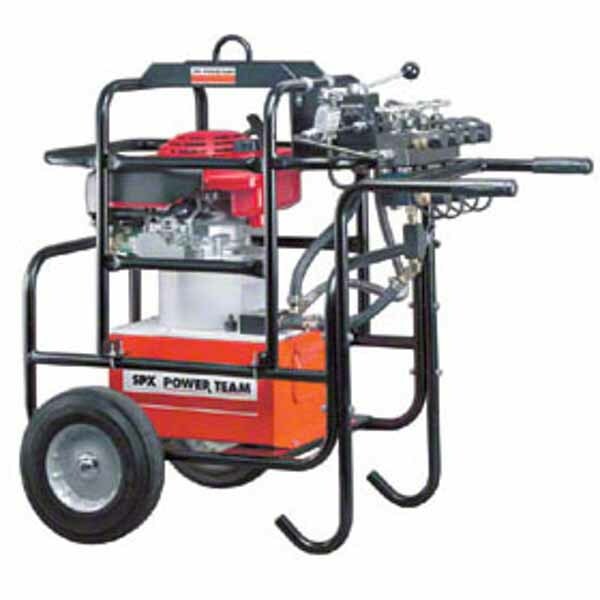 Top performance petrol/hydraulic pumps that deliver 2.1 - 6.4 litres of oil per minute. These large (9 litre) reservoir, roll cage fitted pumps, ideal for multiple-cylinder applications, drive cylinders up to 1000 tons. Perfect for industrial jobs including rigging, structure moving and construction applications and for large scale jobs where compressed air or electricity is unavailable. PG120 - Up to 300 ton cylinders. 5.5 horsepower, Honda 4-cycle engine, featuring electronic ignition and automatic decompression, powers PG1200 Series. 2.1 litres per minute delivered at 700 bar. Large 19 litre reservoir: sufficient capacity for multiple cylinder applications. PG400 - Up to 1000 ton cylinders. Maximum output hydraulic power package, perfectly suited to single or multiple cylinder applications. 15 KW Honda engine is 4 cycle with a large 76 litre (63 litre usable) reservoir with a low oil level sight gauge.